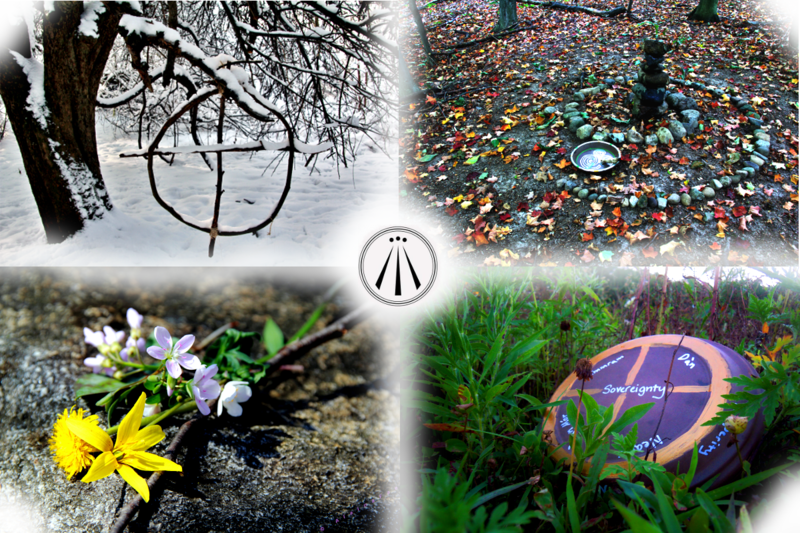 The Silver Branch connects with and celebrates the movement of the seasons with rituals centered around festivals of an eightfold yearly path, often referred to collectively as the Wheel of the Year. Four are the cardinal compass points, the two solstices (north and south) and two equinoxes (east and west), and four are the cross-quarter points of the fire festivals: Samhain (northwest), Imbolc (northeast), Bealtaine (southeast), and Lughnasadh (southwest). The celebration of these festivals arise out of our acknowledgement, reverence, and love of the earth and her place in the cosmos. As the earth moves through the solar system on her orbit, the beauty of life is an ever changing source of wonder and mystery within a circular pattern of death and rebirth. The eightfold path is the celebration of this movement of life, and as we pause from our busy schedules to participate in these celebrations of the mysteries of life, we are replenished with gratitude and brought closer to our authentic place within the grand ecology. For more information on the Wheel of the Year, please see the OBOD website. Three reasons to come ashore: to enter Tara, to pierce the piercing eye, to return the harp.